The minister’s decree (number 458, 2012, signed in August last year) will withdraw forest status from 376,385 hectares, change the forest function in 5,736,830 hectares and bring 45,258 hectares of non-forest land into the forest estate. 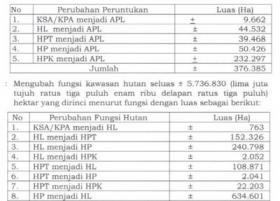 This means that the net loss to the forest zone amounts to 331,127 hectares. The decree follows requests for the changes from Papua’s governor to bring the region’s forest status into line with the provincial spatial plan which is currently being finalised. However the forestry minister did not approve one of the changes requested by the governor, deciding instead to keep the status of an area of 285,344 hectares on Dolok Island in the western part of Merauke as ‘conversion forest’ (see map). As stated in decree 458, this was done in order to create “investment opportunities for non-forest development” (it is not clear what change the governor had requested for this area). Part of Dolok is covered by a 200,000 hectare concession, according to the MIFEE investment plan issued by former district head and MIFEE promoter Johanes Gebze. The concession was held by PT Anugrah Rejeki Nusantara, a company which was bought in 2011 by the giant oil palm producer and trader Wilmar. The permit was later relocated to Animha district, according to the campaign group, awasMIFEE. 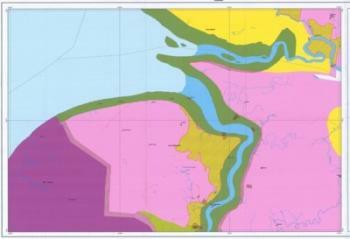 The pink areas on the map are classified as conversion forest – forest for conversion to other uses. Dolok fills the bottom left hand part of the map. Indonesia’s forest classification system divides forests into conservation, protection and production forests, the last group consisting of production forests that can be exploited for timber while remaining as forests, as well as conversion forests, which can be cleared for non-forest use such as food and energy crop plantations. In the list of changes set out in decree 458, the largest area of forest to be taken out of the forest zone, was previously classified as conversion forest (232,297 hectares) and some of this is likely to have been deforested already. However, some 9,662 hectares of conservation forest, 44,532 hectares of protection forest, 39,468 hectares of limited production forest and 50,426 hectares of production forest has also been taken out. For areas of forest being converted to non-forest uses, the decree recommends that the Papua governor “gives or strengthens the rights over forests being changed to non-forest, where these areas have become places in which local communities live and farm, so that there is certainty in those areas.” Accordingly, on the maps accompanying the decree (see example map), small areas around villages have been taken out of the forest zone – a move which appears to ignore the fact that customary lands extend over areas far beyond the areas occupied by buildings and cultivated plots. Customary areas often include large areas of forest used for hunting, gathering food and other forest products as well as forests containing sacred sites. The fact that no reference to customary land is made at all in this decree underlines the lack of progress towards recognising the customary rights of indigenous Papuans over their land and resources. The cross-hatched areas around these villages in Merauke district have been taken out of the forest zone. The yellow area is classified as production forest. The lack of recognition for indigenous rights over land and resources has prompted Papuan civil society organisations to launch their “ Save People and Livelihoods in the Land of Papua” campaign (see MIFEE Update). It has also prompted international criticism of Indonesia - at last year’s UN review of the country’s human rights situation and from the UN Committee on the Elimination of Racial Discrimination (CERD). The forestry maps accompanying decree 458, do not accord with the Indonesia’s moratorium map for Papua. Now in its 3rd revision the moratorium map shows areas subject to the two-year moratorium on clearing primary forests and peatland, announced in May 2011. As the end of the two-year period draws near, it remains to be seen how the new Papua map will fit with the attempt by the President’s UKP4 development delivery unit to create a single map that can be used for all development decision-making, and how far Papua’s provincial government can assert its ownership of the regional development agenda. What isn’t at all clear is how far the local community voices will be heard in areas which are targeted for agribusiness development or which are already being cleared, such as MIFEE. As reports from the MIFEE project area continue to make clear, the rights of indigenous Papuans are being swept aside as companies rush to grab land for large–scale plantations for food and energy crops aimed at domestic and export markets, destroying the sources of food and livelihood that have nurtured the indigenous Malind and Anim communities for generations. http://www.daemeter.org/news/constitutional-court-decision-on-indonesias-forest-zone-could-lay-groundwork-for-sustainable-low-emissions-development/and also ‘Indonesian CSOs call to save Indonesia’s remaining forests’, DTE 95, March 2013, for more background on the Constitutional Court’s decision and its implications. See awasMIFEE, ‘MIFEE ploughs on, despite hitting rocky ground’, at https://awasmifee.potager.org/?page_id=62, and Reuters, 26/May/2011 at http://www.reuters.com/finance/stocks/WLIL.SI/key-developments/article/2331149. For more background on Wilmar, see DTE 93-94, December 2012. 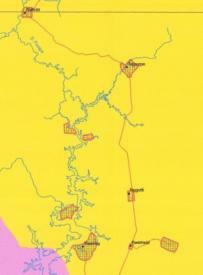 See MIFEE-affected communities want their land back, DTE MIFEE updated, January 2013. See MIFEE campaign page for more background. See also MIFEE-affected communities want their land back, DTE MIFEE updated, January 2013.